Merry Meet my friends! In the midst of baking and celebrating, I thought I’d do a quick post. I have a simmering potpourri on the stove imparting amazing scent throughout my home. I have bacon appetizers just out of the oven (also adding amazing scent! ), no bake cookies are done and I’m about to make my Scottish Shortbread cookies as well. We have had neighbors stopping by with small gifts for us and we gave them their gifts from us and visited a bit. My mom sent over her famous cranberry meatballs for us and my brother to enjoy for dinner tomorrow night. There have been phone calls and texts to dear friends this morning and it’s been a wonderful day so far. As I wrote the other day, our Eve and day of Christmas are actually quite quiet and relaxed. Our extended family won’t gather until Saturday, and my other daughter and her family will be here on Sunday for our day of feasting, visiting and gift exchanging. I am rather enjoying the leisure of this couple of days. After the baking is done, we’ll be reading, watching movies, and relaxing tonight. My brother will be here tomorrow and overnight, and there will be more of the same then. It’s quite lovely! Add a fire (despite the warmth outside) and lit candles and soft music and it’s a perfect Winter evening. For those of you who celebrate Christmas..whether it be a secular, family, Santa day, or you celebrate the birth of Jesus, or you celebrate the Solstice or something else….I wish you all a very Merry Christmas, a Happy Holiday, Blessed Yule, Happy Hanukkah, Happy Kwanza and all the other ways you can celebrate this Yuletide Season. Remember, we are one human race, no matter our differences, with much more in common than not! As Tiny Tim says “Gods Bless us every one”! And in the case of my Pagan/Witch friends..Goddess Bless you all! And don’t forget…it’s a rare Full Christmas Moon! Be sure to take in Her energy! I’m happy I’ll be able to see Her! Merry Yule/Winter Solstice 2015 and Recipes!……. Where I’m sitting right now! Merry Meet my friends…I’m sitting by the fire on this the longest night of the year, in my pj’s with a glass of mulled wine at hand. My daughter and I are watching “A Christmas Story” and I suddenly remembered that I hadn’t written my post yet for Yule! I’m so sorry, but better late than never 🙂 I really did want to share some recipes with you that will come in handy the next 10 days or so. It’s pouring rain, gloomy and windy here and we are on another week of unseasonable temperatures! Record highs in the mid 60’s are expected! I so wish it was snow and not rain! I ran my last couple of errands to do today and I have about 10 packages to wrap and I’m officially all ready for the holidays….. except for a trip to the grocery early tomorrow morning. I’m hoping I can avoid some of the crowds doing that. I’m looking forward to a more quiet Christmas as my family gatherings will be over the weekend rather than the eve or the day of. So reading and relaxing is high on my agenda lol. And yes, those who know me, know that I do gather with my family for Christmas. It’s not a religious holiday for me at all, but it is for many of my family members that I love, so I celebrate with them, but in my own way. As a family time together, celebrating with gifts and food and love and joy! Tonight, I will do some altar work, use my hearth fire to burn that which I wish for, and those things I wish to let go, and I will make time to honor my favored Goddess Hekate. Tomorrow morning, I’ll be up early, toasting the rising of the Sun (whether I can actually see him/her or not) and make my offerings to Mother Earth. The day will be spent partially with family, and then quiet and introspective tomorrow evening. The fire is burning merrily. The house is smudged and candles are lit. I have bayberry, frankincense, pine, orange, clove and cinnamon scents going with the help of incense, candles and a simmering potpourri. Our feast, which we’ll have tomorrow night, will just be soup, salad and bread. Simple and good. Foods for Yule are traditionally: Nuts, apples, caraway cakes soaked with cider, pears, ginger tea, roasted turkey, fruitcake, cookies, eggnog, mulled wine, and pork dishes. But there are other foods as well associated with the season such as gingerbread, ham, cranberries, pomegranates, mince pies, and frankly, whatever else your family tradition is! What are your foods that your family just MUST have on the table for your Yule/Christmas/New Year’s feast? Well, I’ll share a couple of recipes here with you that my family loves, as I have in past postings. I see through my blog stats that MANY of you are checking out all my previous posts for Yule/Solstice and I so appreciate that. Thank you! Hope you like these too! Toast walnut pieces your favorite way. Pour onto a plate to cool and set aside. In a large bowl, whisk together the vinegar, honey, mustard, salt and pepper. Add the olive oil in a thin stream, whisking constantly until the dressing is smooth. Add the greens, pears, pomegranate seeds and walnuts to the bowl with the dressing and toss gently to coat. Divide the salad among 4 plates, garnish with the cheese and serve immediately. Serves 4. *even if you hate fruitcake..try these! In a large bowl, cream the butter and brown sugar until light and fluffy. Add eggs, one at a time, beating well after each. Stir in vanilla. Add flour and walnuts; mix well. Spread evenly into a greased 15-in. x 10-in. x 1-in. baking pan. Sprinkle with pineapple, cherries and dates; press lightly into dough. Bake at 325° for 45-50 minutes or until lightly browned. Cool on a wire rack. Cut into bars. Combine all ingredients in a non-aluminum saucepan, and bring to a simmer (not a boil..it will boil the alcohol right out of it!) over medium-high heat. Reduce heat to medium-low, and let the wine simmer for at least 15 minutes or up to 3 hours. Strain, and serve warm with your desired garnishes. Yum! Sounds warm and cozy doesn’t it?! I hope you give these a try over the holidays. Don’t forget, you can do a search in the box over there ——> under Yule or Winter Solstice to find more from previous years. Remember that tonight and tomorrow night if you wish, is all about the longest night of the year and knowing that the Sun returns and the days will lengthen once again. Think about what our ancestors were thinking on this night. They were hoping they had enough food put away for the long, hard Winter. Winter was hard, no doubt! Isolation, hard work, chopping wood for warmth, and making sure that their livestock survived the long, cold, dark season..along with themselves, had to be a scary time for them. We are so blessed these days. But for tonight, perhaps pretend what it was like to be them. Light a fire and keep it stoked. Light candles all over the house. Turn off the tv, get off the electronics (which I will do as soon as I’m done with this writing 🙂 and perhaps just sit quietly and think, ponder, remember, cherish or make new memories. What do you wish for yourself and your loved ones in the coming months? What do you need to let go of to be happy and content in your life. Are there relationships to repair or depart from? Is there a project you want to take on over the Winter? Do you have a huge stack of books you’ve been dying to read? (I do! ) Well, now you will have the time…most likely. Blessed Yule/Winter Solstice my dear friends. May Winter be kind to you, may Goddess bless you with all the good things in Life, and I thank you so much for your friendship and interest in reading my little blog and letting me know you enjoy it. I so much appreciate it! I share this poem most every Solstice time because I love it so much. This year is no different! Enjoy! The Wheel Turns to Yule 2014………..
We begin in the heart of the darkness. Winter is full upon the Earth; snow veils the landscape, thin trees are brittle with ice, and stars shatter the black mirror of the sky. The air is cold, metallic, sharp to breathe; scarves of woodsmoke drift in the sky over rooftops outlined with twinkling lights, and porch lamps gleam from early in the afternoon until long into the night. Merry Meet my friends! I have been so busy (as I know all of you have been too) that I haven’t had the time or the energy (maybe more the energy lol) to write in my blog. Yule is the day after tomorrow!! I’m ready though. How about you? This year my immediate family…hubby, daughters, son-in-law and grandkids are gathering on Yule Sunday for brunch and our opening of gifts. About 5 years ago we decided to meet as a family on a day other than Christmas Day. This year we opted for Yule as the date. Christmas is then spent with more extended family…grandparents, aunts, uncles, cousins etc. Other than a few packages yet to wrap and some baking to do tomorrow, I’m ready. How are you doing with your preparations? Do you have a feast planned? Family coming over? A more private, solitary day? Whatever way you celebrate it, I hope that you’ve taken time in the all the busyness to BREATHE! The Solstice for me…and many Pagans and Witches…is more about a time of quiet contemplation. Though the Solstice is the first day of Winter, the longest night of the year, it’s also the start of the nights shortening and the days lengthening. Though we have a lot of Winter left, we know that the Wheel turns, the Sun will return and strengthen, and Mother Earth will green and awaken again soon. But in the meantime, the dark time of the year is such a great time for nesting. To me, nesting is relaxing more, reading more, taking on projects around the house, perhaps writing, painting, working on your book of shadows, crafts, learning something new, and of course hanging by a fire and again….relaxing more. I just seem to have more time (well after the New Year especially) to work on myself a bit too. To look within, to be silent, to meditate better. Feeling like I’ve accomplished something over the Winter is always a good thing for me. 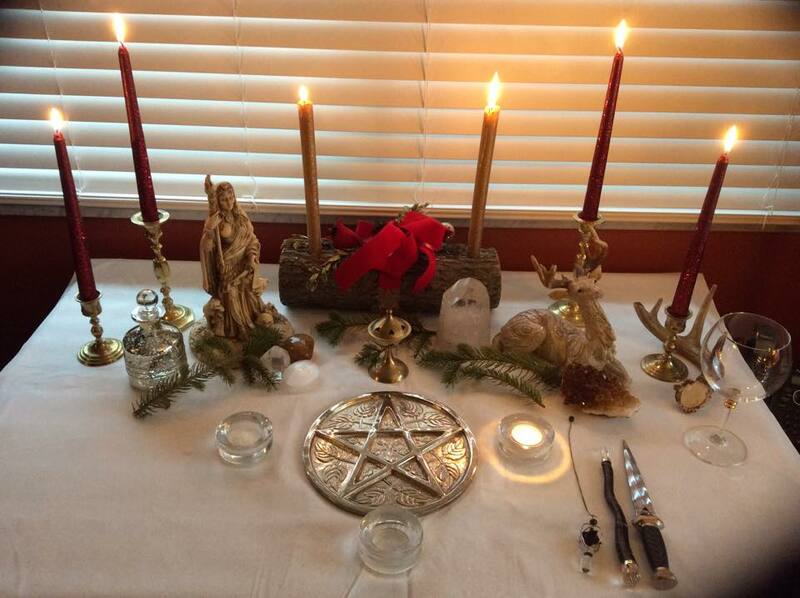 My altar is done…I kept it really simple this year and I think quite elegant. I’ll add more greens tomorrow and of course wine and cakes. After all my family goes home on Sunday, that evening I’ll have time to spend at my altar. I’ll be expressing my gratitude for the past year, throwing out what no longer serves or makes me happy, adjusting in my mind attitudes, angers, hurts, and putting out to the Universe (and myself) what I’d like to have happen in my life in the coming New Year. Now as a Witch, I did some of this at Samhain, the Witches’ New Year. But the New Year calendar- wise…well, it doesn’t hurt to reinforce it. Sometimes I take time to re-dedicate myself to my Path as well. It’s a quiet, solitary ritual that I enjoy very much. Especially in the middle of all the hoopla, chaos, drama, fatigue, over-eating, over-drinking, busyness that is the holidays!!! 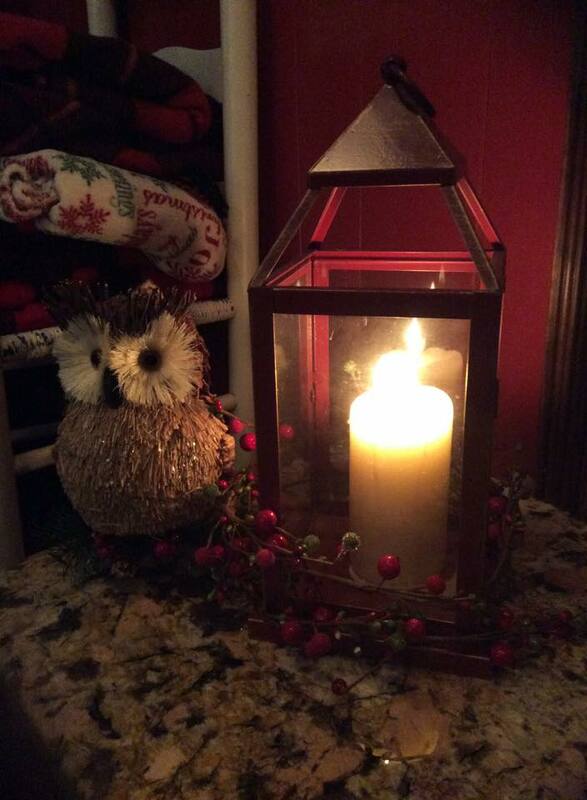 On Yule night…light lots of candles and bring in the greens! Sweep out the old, usher in the new, spend quiet time, contemplate, read, relax….and know that you’ll have time to do this more over the next few months. Maybe a good snow will come and force you to stay in and that’s even better! In a few days, if you celebrate it, Christmas will be here and gone as well…then the New Year. Then Winter will be here in all it’s cold, stark beauty, and you can take a deep breath and say…..AAAAHHHHH!!! I know for many, seasonal depression can set in. Try to find something that interests you, makes you happy. Be alone when you need it and with friends and family when you need that. Be kind to yourself. Find the good things in your Life and hold on to them. Spring will come again..it always does. Have a very Blessed Yule my friends. May the Mighty Ones bestow you with Peace, Love and Joy this Yuletide Season.